18 And the sons of Noah, that went forth of the ark, were Shem, and Ham, and Japheth: and Ham is the father of Canaan.19 These are the three sons of Noah: and of them was the whole earth overspread. A husbandman in England in the medieval and early modern period was a free tenant farmer or small landowner. The social status of a husbandman was below that of a yeoman. The meaning of “husband” in this term is “master of house” rather than “married man”. It has also been used to mean a practitioner of animal husbandry, or in perhaps more modern language, a rancher. What did his younger son do? Why curse Canaan, instead of Ham – Canaan’s father; unless you want to occupy Canaan in 1948. Blessed be the Lord God of Shem. Japheth (Ashkenaz) dwells in the tents of Shem (Hebrews, Arabs, Phonecians, Philistines); and Canaan (Palestine) is his servant. This was all set up. 2 The sons of Japheth: Gomer, and Magog, and Madai, and Javan, and Tubal, and Meshech, and Tiras. Ashkenaz, is Gomer’s son, and Gomer is Noah’s son. 6 And the sons of Ham: Cush, and Mizraim, and Phut, and Canaan. 22 The children of Shem: Elam, and Asshur, and Arphaxad, and Lud, and Aram. In Genesis 10:21-31, Shem is described as the father of Aram, Ashur, and Arphaxad: the biblical ancestors of the Arabs, Aramaeans, Assyrians, Babylonians, Chaldeans, Sabaeans, and Hebrews, etc., all of whose languages are fairly closely related; the language family containing them was therefore named “Semitic” by linguists. The word “Semitic” is derived from Shem, one of the three sons of Noah in Genesis 5:32, Genesis 6:10, Genesis 10:21, or more precisely from the Greek derivative of that name, namely Σημ (Sēm); the noun form referring to a person is Semite. A Semite is a member of any of various ancient and modern Semitic-speaking peoples, mostly originating in the Near East, including: Akkadians (Assyrians and Babylonians), Ammonites, Amorites, Arameans, Chaldeans, Canaanites (including Hebrews/Israelites/Jews/Palestinians/Samaritans and Phoenicians/Carthaginians), Eblaites, Dilmunites, Edomites, Amalekites, Turukku, Ethiopian Semites, Hyksos, Arabs, Nabateans, Maltese, Mandaeans, Mhallami, Moabites, Shebans, Meluhhans, Maganites, Ubarites, Sabians and Ugarites. The name Ashkenazi derives from the biblical figure of Ashkenaz, the first son of Gomer, son of Khaphet, son of Noah, and a Japhetic patriarch in the Table of Nations (Genesis 10). The name of Gomer has often been linked to the ethnonym Cimmerians. 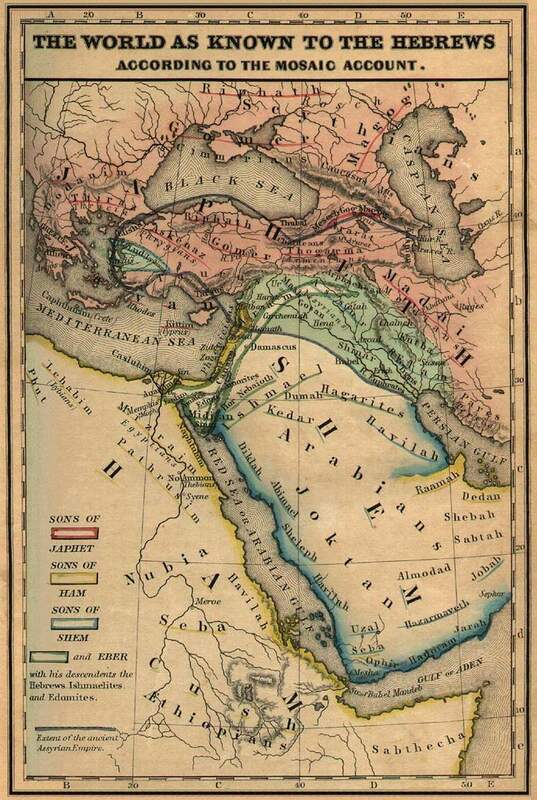 Biblical Ashkenaz is usually derived from Assyrian Aškūza (cuneiform Aškuzai/Iškuzai), a people who expelled the Cimmerians from the Armenian area of the Upper Euphrates, whose name is usually associated with the name of the Scythians. 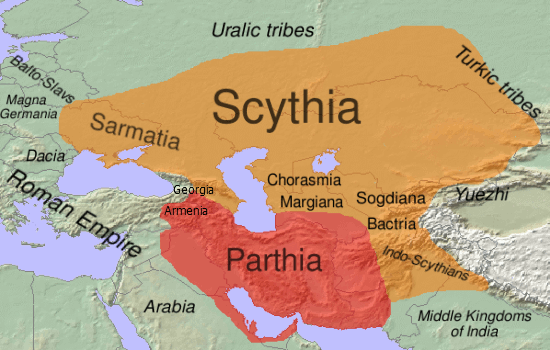 The Cimmerians or Kimmerians were an ancient Indo-European people living north of the Caucasus and the Sea of Azov as early as 1300 BC until they were driven southward by the Scythians into Anatolia during the 8th century BC. Linguistically they are usually regarded as Iranian, or possibly Thracian with an Iranian ruling class. Cimmeria, an ancient name of Crimea, a peninsula in the northern part of the Black Sea. Cimmerians, an ancient people who lived in the south of modern-day Ukraine in the 8th and 7th century BC, usually associated with the ancient Cimmeria or Crimea. 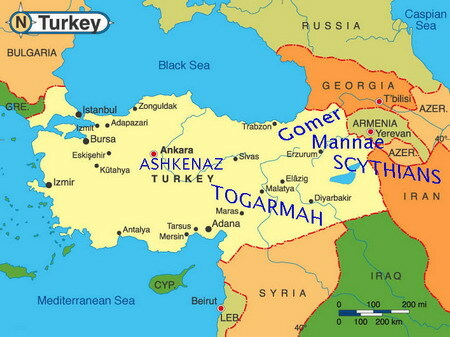 In the Yoma tractate of the Babylonian Talmud the name Gomer is rendered as Germania, which elsewhere in rabbinical literature was identified with Germanikia in northwestern Syria, but later became associated with Germania. Ashkenaz is linked to Scandza/Scanzia, viewed as the cradle of Germanic tribes, as early as a 6th-century gloss to the Historia Ecclesiastica of Eusebius. In the 10th-century History of Armenia of Yovhannes Drasxanakertc’i (1.15) Ashkenaz was associated with Armenia, as it was occasionally in Jewish usage, where its denotation extended at times to Adiabene, Khazaria, Crimea and areas to the east. His contemporary Saadia Gaon identified Ashkenaz with the Saquliba or Slavic territories, and such usage covered also the lands of tribes neighboring the Slavs, and Eastern and Central Europe. In modern times, Samuel Krauss identified the Biblical “Ashkenaz” with Khazaria. The Khazars (Turkish: Hazarlar, Tatar: Xäzärlär, Hebrew: כוזרים (Kuzarim), Arabic: خزر‎ (khazar), Russian: Хазары, Persian: خزر‎, Greek: Χάζαροι, Latin: Gazari/Cosri/Gasani) were a semi-nomadic Turkic people who created what for its duration was the most powerful polity to emerge from the breakup of the western Turkish steppe empire, known as the Khazar Khanate or Khazaria. Astride a major artery of commerce between northern Europe and southwestern Asia, Khazaria became one of the foremost trading emporia of the medieval world, commanding the western marches of the Silk Road and played a key commercial role as a crossroad between China, the Middle East, and Kievan Rus’. For some three centuries (c. 650–965) the Khazars dominated the vast area extending from the Volga-Don steppes to the eastern Crimea and the northern Caucasus. 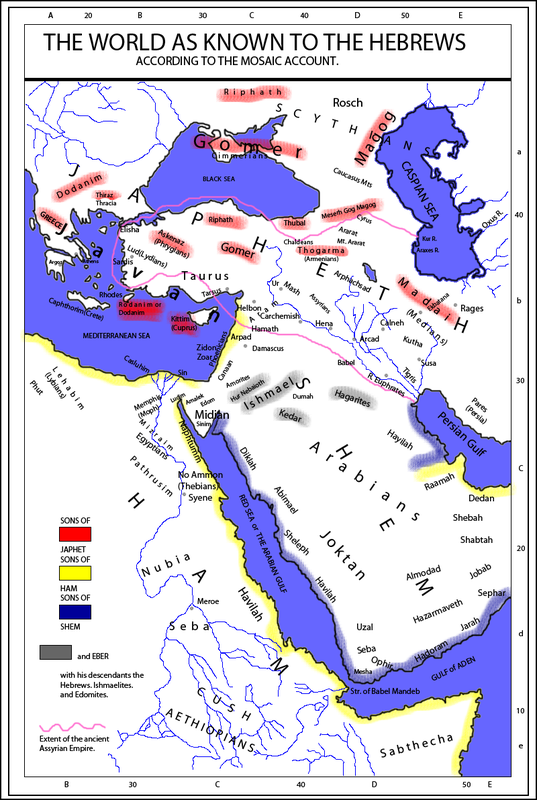 Khazaria long served as a buffer state between the Byzantine empire and both the nomads of the northern steppes and the Umayyad empire, after serving as Byzantium’s proxy against the Sasanian Persian empire. The alliance was dropped around 900. Byzantium began to encourage the Alans to attack Khazaria and weaken its hold on Crimea and the Caucasus, while seeking to obtain an entente with the rising Rus’ power to the north, which it aspired to convert to Christianity. Between 965 and 969, the Kievan Rus ruler Sviatoslav I of Kiev conquered the capital Atil and destroyed the Khazar state. Beginning in the 8th century, Khazar royalty and notable segments of the aristocracy converted to Judaism. Khazar origins for, or suggestions Khazars were absorbed by many peoples, have been made regarding the Slavic Judaising Subbotniks, the Bukharan Jews, the Muslim Kumyks, Kazakhs, the Cossacks of the Don region, the Turkic-speaking Krymchaks and their Crimean neighbours the Karaites to the Moldavian Csángós, the Mountain Jews and others. In rabbinic literature, the kingdom of Ashkenaz was first associated with the Scythian region, then later with the Slavic territories, and, from the 11th century onwards, with northern Europe and Germany. The region of Ashkenaz was centred on the Rhineland and the Palatinate (notably Worms and Speyer), in what is now the westernmost part of Germany. Its geographic extent did not coincide with the German Christian principalities of the time, and it included northern France. 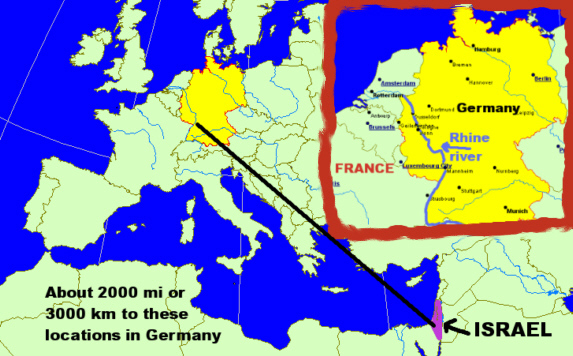 By the high medieval period, Talmudic commentators like Rashi began to use Ashkenaz/Eretz Ashkenaz to designate Germany, earlier known as Loter, where, especially in the Rhineland communities of Speyer, Worms and Mainz, the most important Jewish communities arose. Rashi uses leshon Ashkenaz (Ashkenazi language) to describe German speech, and Byzantium and Syrian Jewish letters referred to the Crusaders as Ashkenazim. Given the close links between the Jewish communities of France and Germany following the Carolingian unification, the term Ashkenazi came to refer to both the Jews of medieval Germany and France. How the name of Ashkenaz came to be associated in the rabbinic literature with the Rhineland is a subject of speculation. In rabbinic literature from the 11th century, Ashkenaz was considered the ruler of a kingdom in the North and of the Northern and Germanic people. Sometime in the early medieval period, the Jews of central and eastern Europe came to be called by the name Ashkenazim, in conformity with the custom of designating areas of Jewish settlement with biblical names, Spain being identified as Sefarad (Obadiah 20), France as Tsarefat (1 Kings 17:9), and Bohemia as Land of Canaan. By the high medieval period, Talmudic commentators like Rashi began to use Ashkenaz/Eretz Ashkenaz to designate Germany, earlier known as Loter, where, especially in the Rhineland communities of Speyer, Worms and Mainz, the most important Jewish communities arose. Rashi uses leshon Ashkenaz (Ashkenazi language) to describe the German language, and Byzantium and Syrian Jewish letters referred to the Crusaders as Ashkenazim. Given the close links between the Jewish communities of France and Germany following the Carolingian unification, the term Ashkenazi came to refer to both the Jews of medieval Germany and France. Ashkenazi Jewish culture later spread into Eastern Europe and then to all parts of the world with the migrations of Ashkenazi Jews. Because of this tradition, Askanaz is a male given name still used today by Armenians. In 1498, a monk named Annio da Viterbo published fragments known as “Pseudo-Berossus”, now considered a forgery, claiming that Babylonian records had shown that Noah had more than the three sons listed in the Bible. Specifically, Tuiscon or Tuisto is given as the fourth son of Noah, who had been the first ruler of Scythia and Germany following the dispersion of peoples, with him being succeeded by his son Mannus as the second king. Askenaz, or Askanes, called by Aventinus Tuisco the Giant, and by others Tuisto or Tuizo (whom Aventinus makes the 4th son of Noah, and that he was born after the flood, but without authority) was sent by Noah into Europe, after the flood 131 years, with 20 Captains, and made a settlement near the Tanais, on the West coast of the Euxin sea (by some called Asken from him) and there founded the kingdom of the Germans and the Sarmatians… when Askenaz himself was 24 years old, for he lived above 200 years, and reigned 176. In the vocables of Saxony and Hessia, there are some villages of the name Askenaz, and from him the Jews call the Germans Askenaz, but in the Saxonic and Italian, they are called Tuiscones, from Tuisco his other name. In the 25th year of his reign, he partitioned the kingdom into Toparchies, Tetrarchies, and Governments, and brought colonies from diverse parts to increase it. He built the city Duisburg, made a body of laws in verse, and invented letters, which Kadmos later imitated, for the Greek and High Dutch are alike in many words. The 20 captains or dukes that came with Askenaz are: Sarmata, from whom Sarmatia; Dacus or Danus – Dania or Denmark; Geta from whom the Getae; Gotha from whom the Goths; Tibiscus, people on the river Tibiscus; Mocia – Mysia; Phrygus or Brigus – Phrygia; Thynus – Bithynia; Dalmata – Dalmatia; Jader – Jadera Colonia; Albanus from whom Albania; Zavus – the river Save; Pannus – Pannonia; Salon – the town Sale, Azalus – the Azali; Hister – Istria; Adulas, Dietas, Ibalus – people that of old dwelt between the rivers Oenus and Rhenus; Epirus, from whom Epirus. Askenaz had a brother called Scytha (say the Germans) the father of the Scythians, for which the Germans have of old been called Scythians too (very justly, for they came mostly from old Scythia) and Germany had several ancient names; for that part next to the Euxin was called Scythia, and the country of the Getes, but the parts east of the Vistule or Weyssel were called Sarmatia Europaea, and westward it was called Gallia, Celtica, Allemania, Francia and Teutonia; for old Germany comprehended the greater part of Europe; and those called Gauls were all old Germans; who by ancient authors were called Celts, Gauls and Galatians, which is confirmed by the historians Strabo and Aventinus, and by Alstedius in his Chronology, p. 201 etc. Askenaz, or Tuisco, after his death, was worshipped as the ambassador and interpreter of the gods, and from thence called the first German Mercury, from Tuitseben to interpret. In the 19th century, German theologian, August Wilhelm Knobel, again equated Ashkenaz with the Germans deriving the name of the Aesir from Ashkenaz. 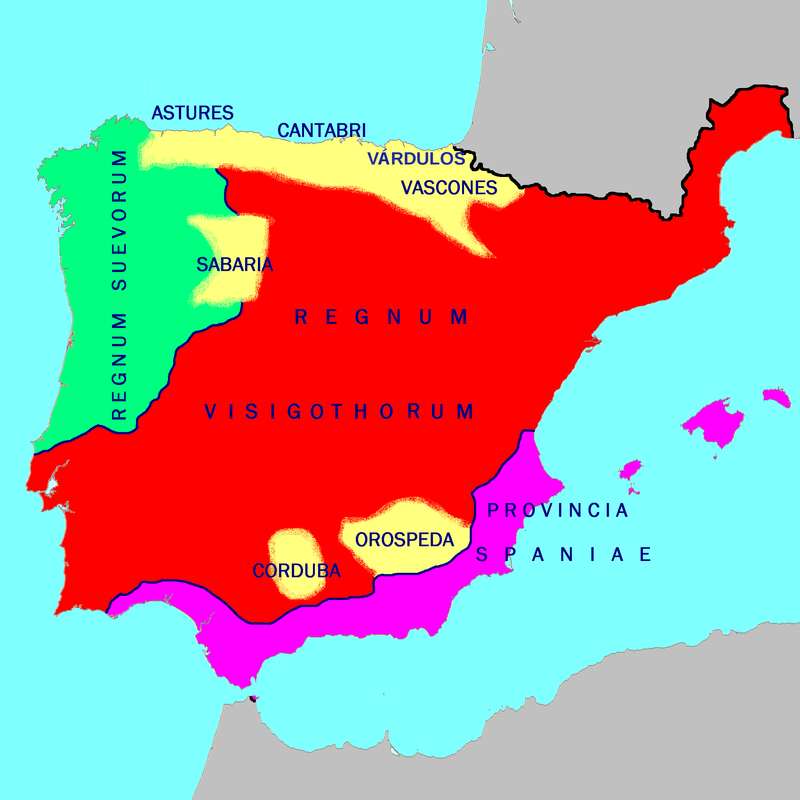 In the Visigothic kingdom, which became centred on Toledo by the end of the reign of Leovigild, the province of Gallia Narbonensis, usually shortened to just Gallia or Narbonensis and never called Septimania, was both an administrative province of the central royal government and an ecclesiastical province whose metropolitan was the Archbishop of Narbonne. Originally, the Goths may have maintained their hold on the Albigeois, but if so it was conquered by the time of Chilperic I. There is archaeological evidence that some enclaves of Visigothic population remained in Frankish Gaul, near the Septimanian border, after 507. The province of Gallia held a unique place in the Visigothic kingdom, as it was the only province outside of Iberia, north of the Pyrenees, and bordering a strong foreign nation, in this case the Franks. The kings after Alaric II favoured Narbonne as a capital, but twice (611 and 531) were defeated and forced back to Barcelona by the Franks before Theudis moved the capital there permanently. 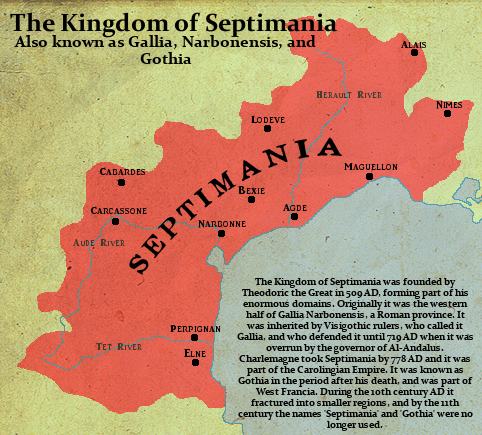 Under Theodoric Septimania had been safe from Frankish assault, but was raided by Childebert I twice (531 and 541). When Liuva I succeeded the throne in 568, Septimania was a dangerous frontier province and Iberia was wracked by revolts. Liuva granted Iberia to his son Leovigild and took Septimania to himself. During the revolt of Hermenegild (583–585) against his father Leovigild, Septimania was invaded by Guntram, King of Burgundy, possible in support of Hermenegild’s revolt, since the latter was married to his niece Ingundis. The Frankish attack of 585 was repulsed by Hermenegild’s brother Reccared, who was ruling Narbonensis as a sub-king. Hermenegild died at Tarragona that year and it is possible that he had escaped confinement in Valencia and was seeking to join up with his Frankish allies. Alternatively, the invasion may have occurred in response to Hermenegild’s death. Reccared meanwhile took Beaucaire (Ugernum) on the Rhône near Tarascon and Cabaret (a fort called Ram’s Head), both of which lay in Guntram’s kingdom. Guntram ignored two pleas for a peace in 586 and Reccared undertook the only Visigothic invasion of Francia in response. However, Guntram was not motivated solely by religious alliance with the fellow Catholic Hermenegild, for he invaded Septimania again in 589 and was roundly defeated near Carcassonne by Claudius, Duke of Lusitania. It is clear that the Franks, throughout the sixth century, had coveted Septimania, but were unable to take it and the invasion of 589 was the last attempt. In the seventh century Gallia often had its own governors or duces (dukes), who were typically Visigoths. Most public offices were also held by Goths, far out of proportion to their part of the population. During the 1st millennium BC, in the Bronze Age, the first wave of migrations into Iberia of speakers of Indo-European languages occurred. These were later (7th and 5th centuries BC) followed by others that can be identified as Celts. Eventually urban cultures developed in southern Iberia, such as Tartessos, influenced by the Phoenician colonization of coastal Mediterranean Iberia, with strong competition from the Greek colonization. These two processes defined Iberia’s cultural landscape – Mediterranean towards the southeast and a Continental in the northwest. In the early 5th century, Germanic tribes invaded the Iberian Peninsula, namely the Suebi, the Vandals (Silingi and Hasdingi) and their allies, the Sarmatian Alans. Only the kingdom of the Suebi (Quadi and Marcomanni) would endure after the arrival of another wave of Germanic invaders, the Visigoths, who conquered all of the Iberian Peninsula and expelled or partially integrated the Vandals and the Alans. The Visigoths eventually conquered the Suebi kingdom and its capital city Bracara (modern day Braga) in 584–585. They would also conquer the province of the Byzantine Empire (552–624) of Spania in the south of the peninsula and the Balearic Islands.